August has proven to be a jackpot on the fishing grounds! 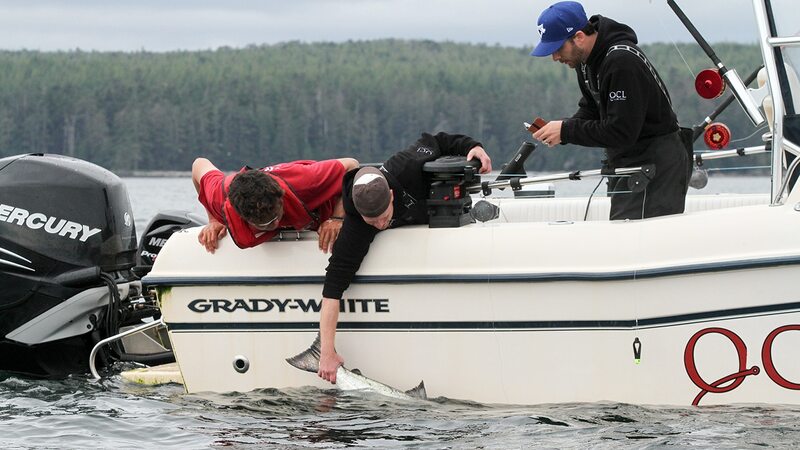 The arrival – maybe a little later than “normal” – of large numbers of salmon feeding on an abundance of baitfish just slightly offshore, has treated QCL anglers to more fantastic fishing. While it’s still fishing, and not always “catching”, the opportunities out there are keeping guests pretty busy! 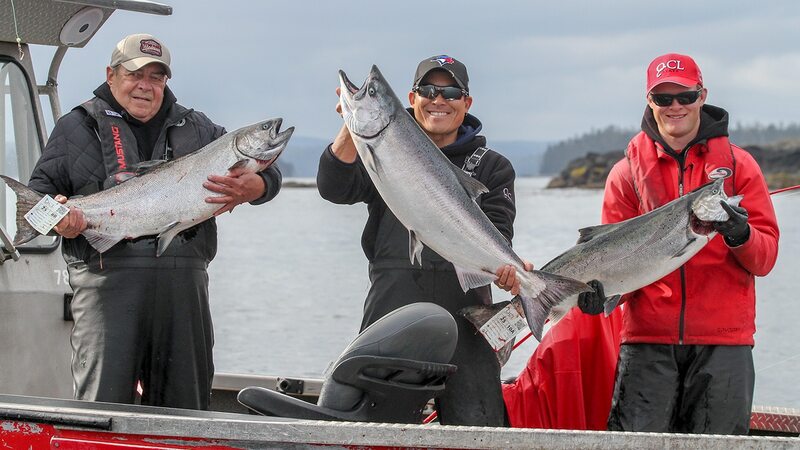 The makeup of this fishery includes all five species – with Chinook dominating, Coho and Pinks filling in, plus some random Chum and even Sockeye showing up! Here’s hoping that they don’t move through to quickly! Meanwhile, back near the rocks and all the usual fishing holes, we’re still getting a good supply of Tyee-class Chinooks that keeps the party going at the Bell Ringer every night. 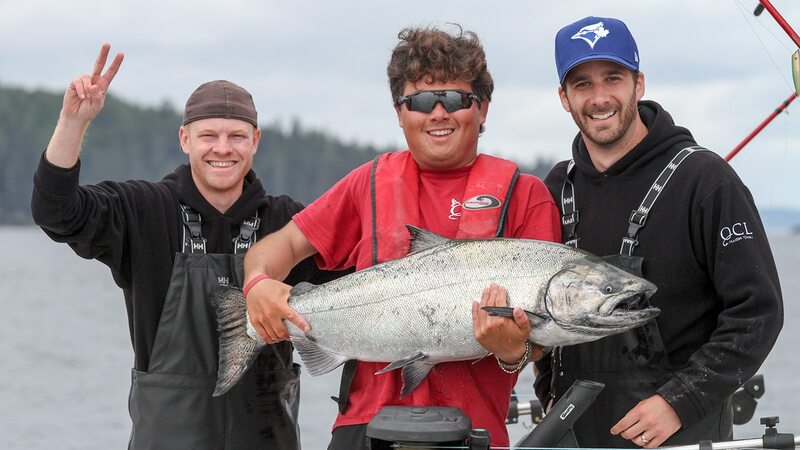 Twelve-year old Jake L was the rockstar last week with two 31-pounders and he released a massive Chinook that taped out to 67 pounds! Congratulations Jake! That’s our largest salmon so far this season! These fish and a number of other nice Tyees were caught over at Cape Edenshaw, a most productive destination after a week of prolonged northwesterly winds pushed so much bait onto that shore! Luke “Skywalker” and his guest Ron R found a nice 44-pounder over there, Bill G released a beauty that taped out to 43 lb., Kevin H sent back a 32 and his Dad Tom released a 37 just 2 hours before! out of more than 200 Tyees caught over the years, they were unable to revive a nice 39-pounder. We’re sure this salmon will be enjoyed by many friends and family this winter! Congrats! Fishing with guide Kingsley, Emery B did manage to release his 39-pounder, caught out in 170 feet of water on a small 2 ½ inch spoon! You just never know where the big ones are going to turn up! Fantastic fishing guys! 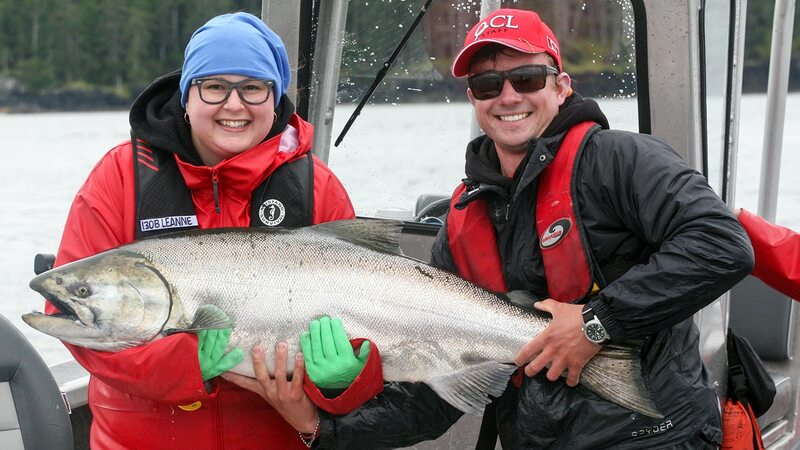 The big salmon of the weekend was a stunning 44-pounder caught by Leanne R with guide Gaelan off Bird Rock. The Tyee bell was ringing mightily on Saturday night when that one came to the scale. However it may have been slightly overshadowed by the 20 clangs of the bell when James J showed up to declare his monster Halibut that was taped out to 203 pounds by his guide Matt Burr! Not far behind was Willy H who released a 34 lb Chinook and a 185 lb. Halibut on the same day! So many great memories shared up here at the Lodge!